An attractive twenty something from Toronto was recommended by a happy patient of Dr Oakley Smith. She wanted the hump gone and her tip narrowed. 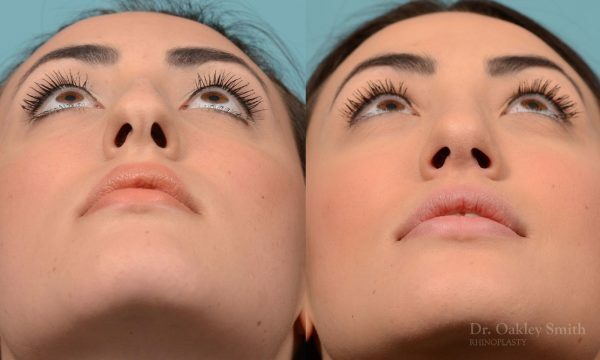 Dr Smith pointed out that she had a bifid tip where a vertical crease can be seen in the middle of her tip. Also her columella was ever so slightly drooping. She agreed to having these minor issues addressed too. 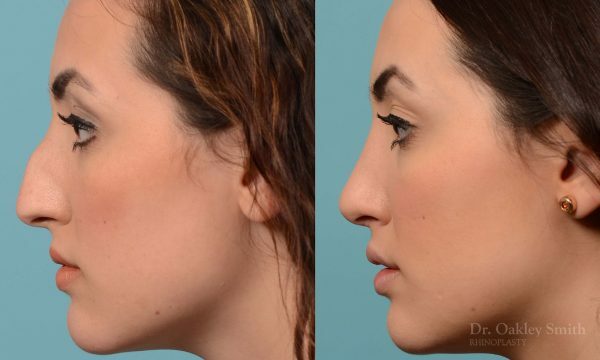 After removing her bump, the nasal bones required breaking in order to close the open spaces between the bones and cartilages. 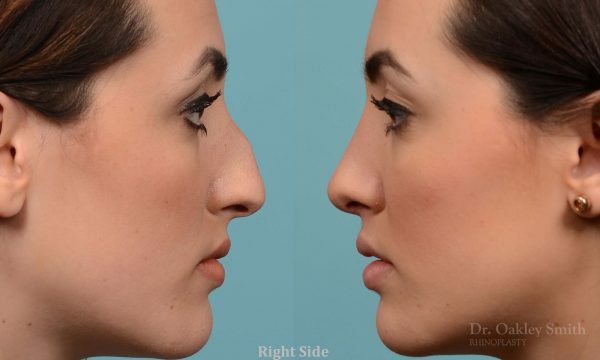 This reduces the likelihood of visible ridges after the swelling clears months following her rhinoplasty. Breaking her bones was also needed to narrow her bridge. 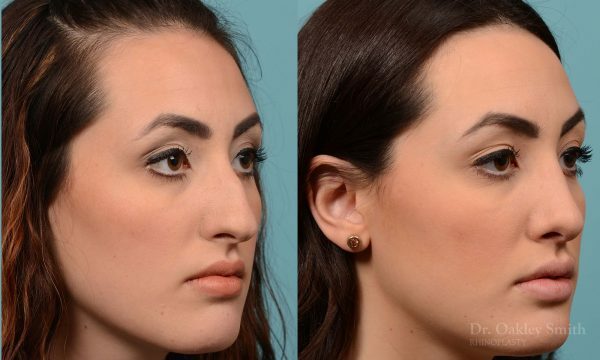 You can notice her bridge was in fact too narrow pre-operatively and this caused her tip to appear even wider than it already was. Her bridge after surgery is wider even with the breaking. This example shows every goal was attainted. 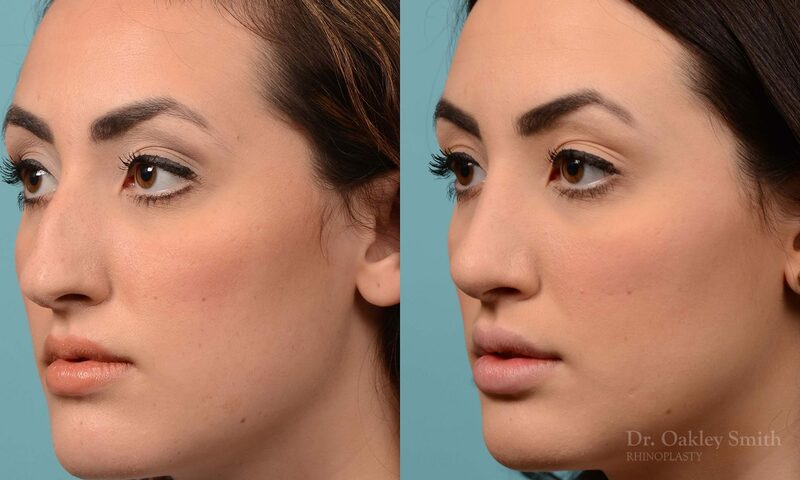 The bump is gone, her tip is narrowed, the bifid crease is gone and the slightly droopy angled columella is raised and smoother. Each change comes with a probability of success. The probability of the changes requested in this case were fortunately quite high (>90%). However the overall probability of each and every one being successful drops from high to good (70%). 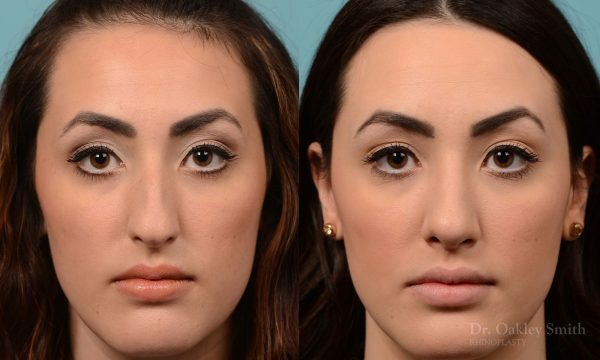 The overall improvements have resulted in making a nose which stood out to disappear and her natural beauty to emerge. Before and after photos of Dr Oakley Smith, a well known Facial Plastic surgeon based in Toronto.